Cast members in "The Elementary Spacetime Show." What does one troubled girl's suicide matter when weighed against the enormousness of an unfeeling universe? Quite a lot, if judged by the wealth of theatrical potency, musical skill, and humor displayed by César Alvarez's musical The Elementary Spacetime Show, a new work that, given a wide enough audience, will become Rent for the social-media generation. But Alvarez's book draws on a tradition of fantasy, science, philosophy, and humor that includes Lewis Carroll, Doctor Who, Monty Python, Willy Wonka, and the ideas of physics and cosmology. Instead of dying, Alameda awakes inside a liminality presided over by a scientist (Electra Weston) and explained by the MC (Salty Brine) as an "in-between environment" invoked by the universe every time a teenager tries to commit suicide. To escape, Alameda must pass eight challenges, from debating Albert Camus (Andrew Reiff) over the rationality of suicide to beating her parents and a sentient robot (Mariah Cary Richard) in a quiz show. Mid-game rewards include meeting Hamlet (an excellent Michael Adrian Burgos). And the big payoff for winning? Alameda can choose whether she lives or truly dies. Alvarez infuses this linear structure of challenges and rewards with 16 songs, ranging from the vaudevillian romp "The Meaningless Equation" (stunningly performed by Shannon DeVaughn as Precious), several songs delivered soulfully by Alameda that Amy Winehouse or Lana Del Ray might have recorded, and a heartfelt country ballad set to a lone guitar in "The Princess Myth." Here, Alvarez spins out her struggle with the lines "maybe there's a different myth that I'd feel better living with." 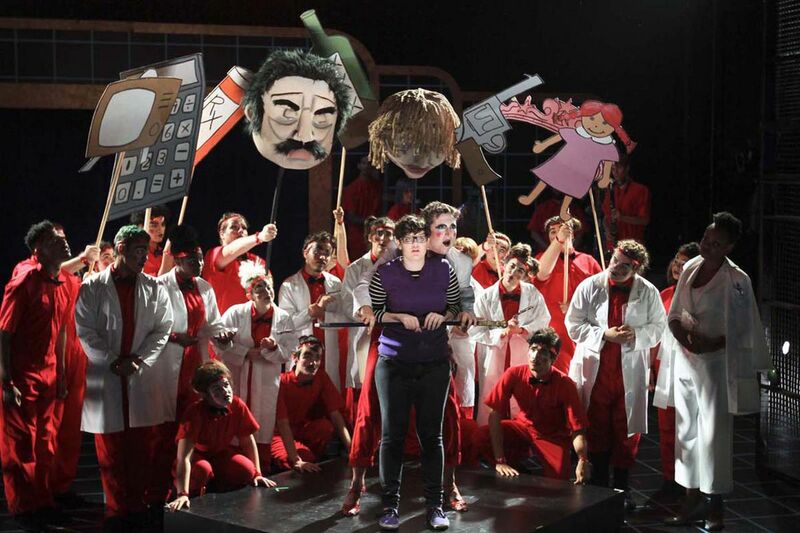 An ensemble of red-jumper-wearing Players depict angels, phone-in callers, a giant Mosquito (Savannah Souza), and other troubled teens. Tilly Grime's fabulous costumes and clownish makeup blend eeriness with sterility, and the choreography of Sonya Tayeh and Ben Hobbs both excites and terrifies. A five-piece band rivets through the memorable, toe-tapping songs - although an improved sound design would have rendered the lyrics more intelligible, particularly when the chorus backs up a lone singer. Combined with a chorus that at times sounds celestial, Alvarez's use of science and philosophy yields a secular alternative to humanity's quest for meaning. The ideas fascinate, the humor tears wounds open, and the power of his music and one moment of sentimentality (when Alameda must pass the challenge of confronting herself, played by Marlee Gordon), adds at least one audience member's rebuttal to the MC's line that "the universe doesn't care if you live." "The Elementary Spacetime Show": Through Sept. 24 at the Arts Bank, 601 S. Broad St. Tickets: $15 to $29. Information: 215-413-1318 or fringearts.com.